Citation Information: J Clin Invest. 2005;115(12):3573-3578. https://doi.org/10.1172/JCI26003. The gut peptide ghrelin, the endogenous ligand for the growth hormone secretagogue receptor, has been implicated not only in the regulation of pituitary growth hormone (GH) secretion but in a number of endocrine and nonendocrine functions, including appetitive behavior and carbohydrate substrate utilization. Nevertheless, recent genetic studies have failed to show any significant defects in GH levels, food intake, or body weight in adult ghrelin-deficient (Ghrl−/−) mice. 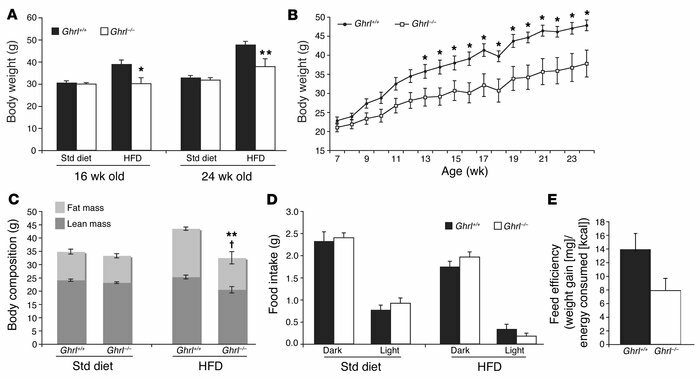 Here we demonstrate that male Ghrl−/− mice are protected from the rapid weight gain induced by early exposure to a high-fat diet 3 weeks after weaning (6 weeks of age). This reduced weight gain was associated with decreased adiposity and increased energy expenditure and locomotor activity as the animals aged. Despite the absence of ghrelin, these Ghrl−/− mice showed a paradoxical preservation of the GH/IGF-1 axis, similar to that reported in lean compared with obese humans. These findings suggest an important role for endogenous ghrelin in the metabolic adaptation to nutrient availability. Differential effects of diet on body weight and body composition in male Ghrl–/– mice. (A) Body weights of male Ghrl+/+ and Ghrl–/– mice maintained on standard (Std) diet were similar at 16 and 24 weeks of age (n = 8/genotype). When maintained on the HFD from 3 weeks after weaning, male Ghrl–/– mice showed a significant reduction in body weight compared with Ghrl+/+ mice at 16 and 24 weeks of age (**P < 0.05; n = 8/genotype). (B) Male Ghrl–/– mice fed the HFD 3 weeks after weaning showed a significant reduction in body weight from 13 weeks of age onward; repeated measures ANOVA, effect of age × genotype: F(1, 17) = 5.895; P < 0.0001 (*P < 0.05, post-hoc test). (C) Body composition of male Ghrl+/+ and Ghrl–/– mice at 20 weeks of age on the standard diet was similar (n = 8/genotype), whereas on the HFD, lean and fat mass were reduced in Ghrl–/– mice (**P < 0.05 for fat mass; †P < 0.01 for lean mass; n = 8/genotype). (D) Absolute food intake of male Ghrl+/+ and Ghrl–/– mice on the standard diet (n = 4–5/genotype) and HFD (n = 8/genotype) were similar during the light and dark periods. (E) Feed efficiency (calculated from caloric intake and body weight gain between 15 and 16 weeks of age) of Ghrl+/+ and Ghrl–/– mice on the HFD (n = 7/genotype).